Corporate restaurant manager and catering company Guckenheimer was looking to develop fresh stations that captured current food trends. But that wasn’t all. The eating experience had to be both unique for consumers and easily replicable for unit operators. 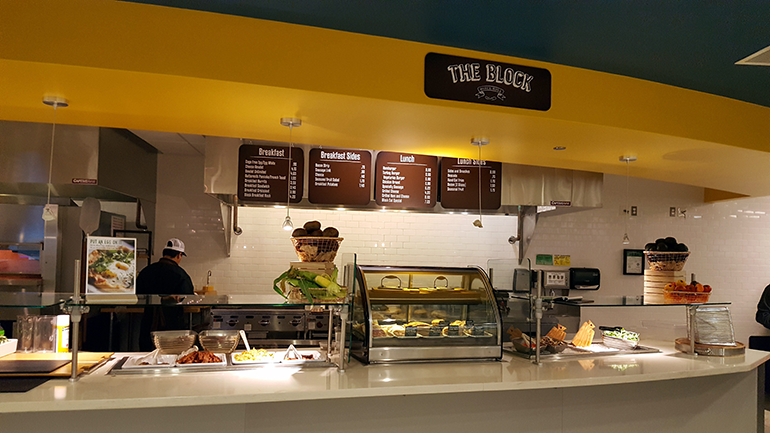 That’s how they came up with The Block, a revamp of their standard grill station. Introduced in 2017 at GoDaddy Corporate Headquarters in Tempe, Ariz., the new retail concept bills itself as a modern butchery. It still offered traditional grill favorites like burgers and chicken sandwiches. But the new, module-style menu items also served up plenty of twists on the classics. And updating the existing equipment rather than starting a new station from scratch made sense financially. “With a good idea and equipment that we could utilize, it felt like it was the most actionable program,” says Guckenheimer Director of Marketing Innovation Cory Rockwood. Each module has a minimum of 20 recipes from which unit operators can choose. Some, like The Better Burger and Steak House Salad modules offer updated versions of the classics—think grass-fed beef burgers with farmhouse white cheddar or smoked ham salad with greens, tomatoes, egg, bacon, smoked cheddar and buttermilk dressing. Others are more unexpected. Crock’d Slow and Fast offers simple, slow-cooked dishes designed to help ingredients retain maximum nutrients. Grinders 2.0 delivers updated versions of the hot supersized sandwiches. Steakhouse Sides and Mashes has flavorful, comforting accompaniments like house-baked bread and butter, hand-cut fries, and crispy fried Brussels sprouts with house-cut bacon and caramelized onions. There’s even a Butcher Breakfast module with house hash and egg dishes. 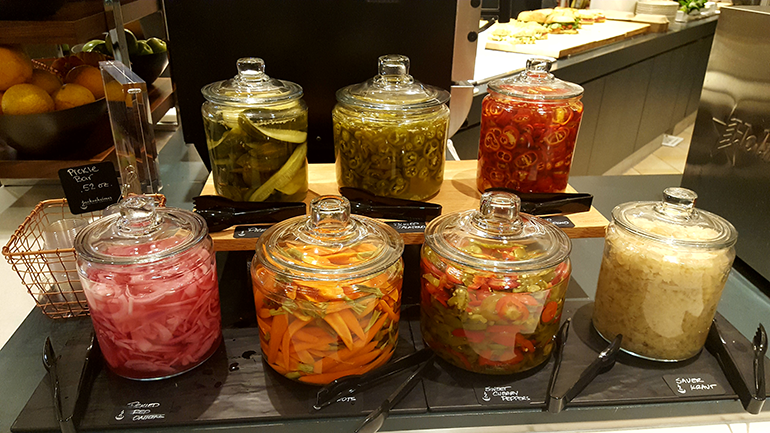 Units also have the option to include a housemade pickle bar (below) with items like sauerkraut, pickled red onions, pickled carrots and pickled jalapeno peppers. Not every operator utilizes every module. But the one must-have module is The Block’s Butcher Case, where customers can buy raw ingredients to cook later. “We display the meats—like burgers, some steaks, chicken and fish—and a scale. We can slice it, weigh it and sell it to customers to take home,” Rockwood explains. Guckenheimer was able to source an inexpensive countertop refrigerated display case that works on low amperage power and can be plugged in almost anywhere. In locations where Guckenheimer is involved in the initial buildout, operators can also choose to install a full floor model case measuring 10 to 12 feet wide. But operators who aren’t able to invest in even the smaller the case (or don’t have the space for one) can also use an ice bed application with a top that creates the appearance of a display case. “If it’s not a standard that everyone can do, then it’s not a standard,” Rockwood says. “We wanted to create a standard that everyone can do, but we don’t want to handcuff the larger units.” Locations that stay open after lunch can often hold customer butcher purchases for pickup at the end of the day. According to Rockwood, butcher sales in those locations are more successful. Regardless of unit size, The Block has proved a hit. Since its initial launch at GoDaddy, which serves a population of 1,400, quarterly grill station sales increased by more than $4,000, while check averages jumped by 4.25%. What’s more, the Block has expanded to multiple locations around the country, including at Clorox in central California; Hewlett Packard locations in Houston and Fort Collins, Colo.; and Shire locations in Los Angeles. Aside from tasty food, that success is largely the result of being able to easily replicate the concept—while still acknowledging the individual needs of different units. For instance, while some Block units buy whole animals or primal cuts, not everyone is able to do that. “It’s absolutely a goal, but we really build in that freedom to give them all the options to stay on standard,” Rockwood says.